Please join the Center for Nursing Excellence in congratulating Gamnell Harris for being selected as the November BEE Award winners! Gamnell is a Patient Services Associate on F9 – ENT/Orthopedic Surgical Specialties and was nominated by a co-worker. The following is the story of how Gamnell impacted the patients’ life in a way that they will never forget. 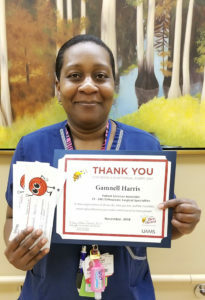 Please congratulate Gamnell for Being Exceptional Every day at UAMS!